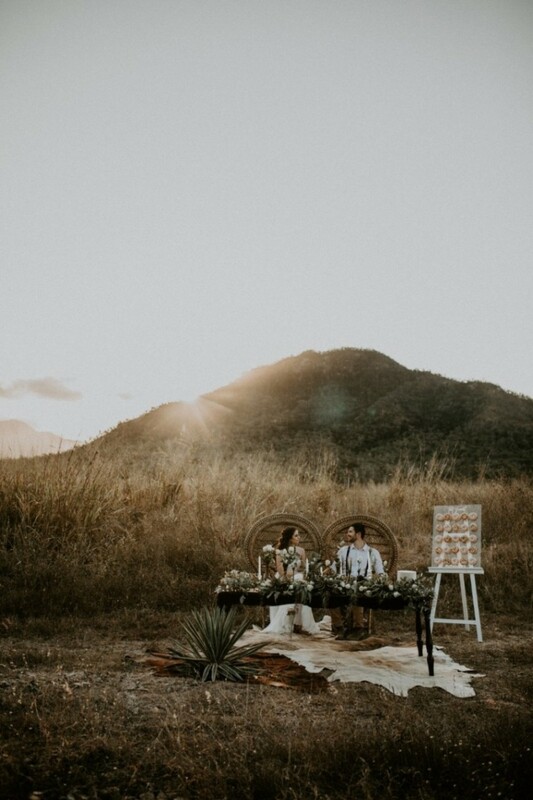 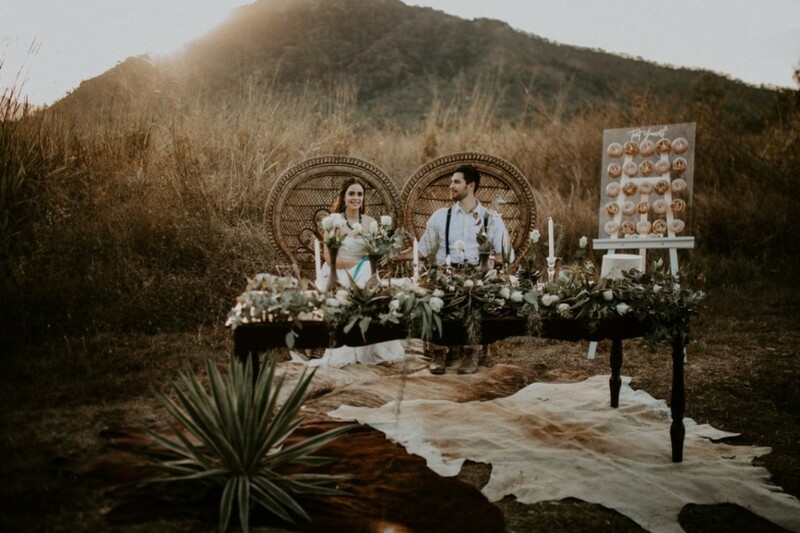 This shoot was inspired by the tapestry of textures found in the Australian Outback, the non-conformist Boho spirit and the unique earthy characteristics of the South-western vibe. 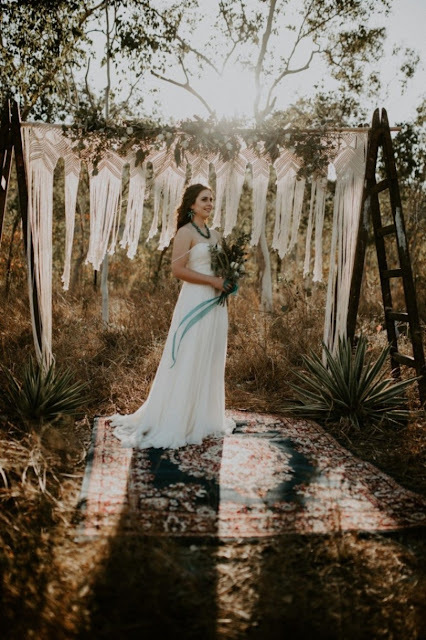 The variety of style elements were woven together by the group of talented vendors to make something truly individual. 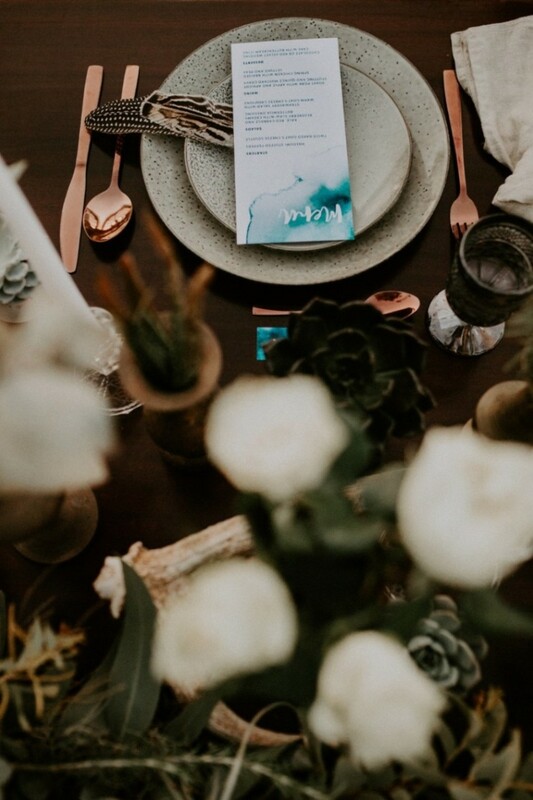 There was a vast array of textures used in all aspects of the wedding with the colour palette kept natural and neutral except for the pops of turquoise that shone through. 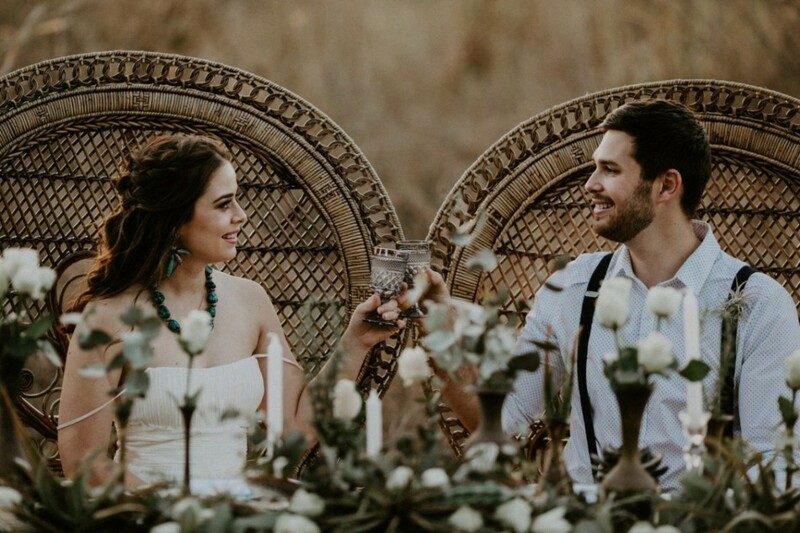 It was very important for us to tell the story of our lovebirds, who were already married and celebrating their anniversary two days later. 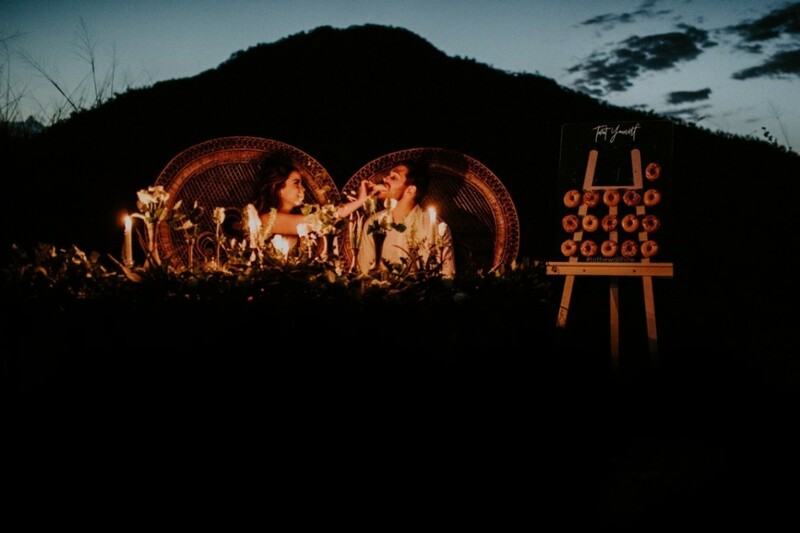 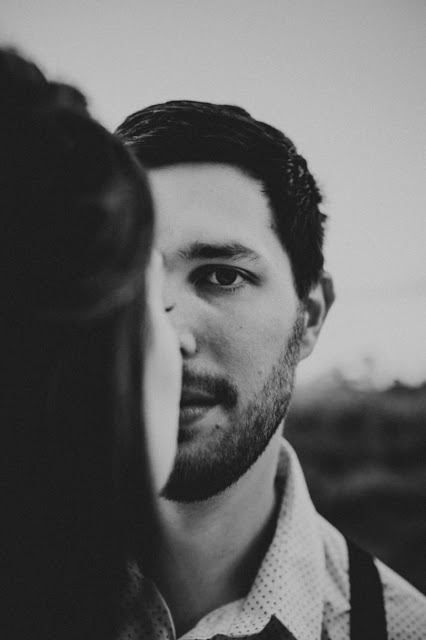 We began with an intimate session in the comfort of our couple's own home to tell their cherished tale. 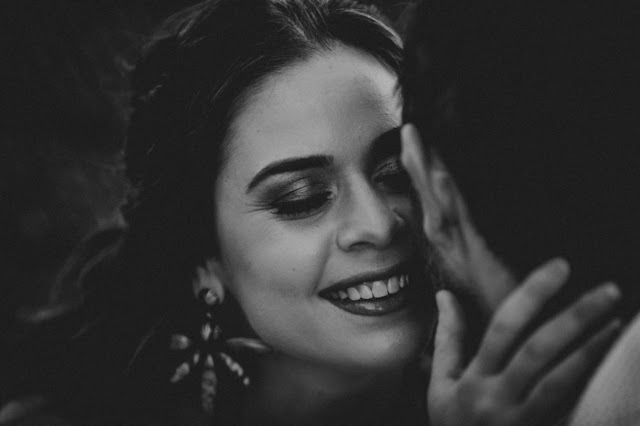 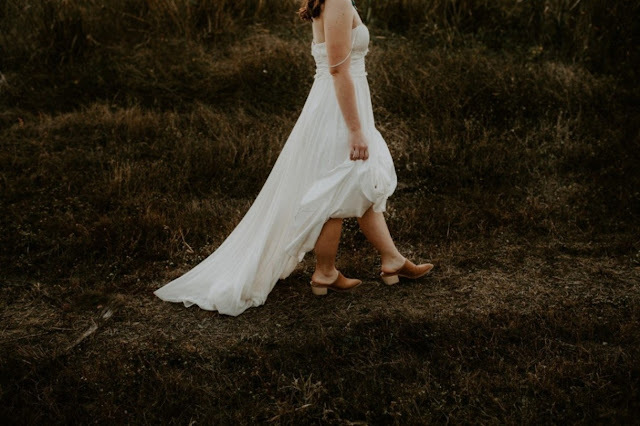 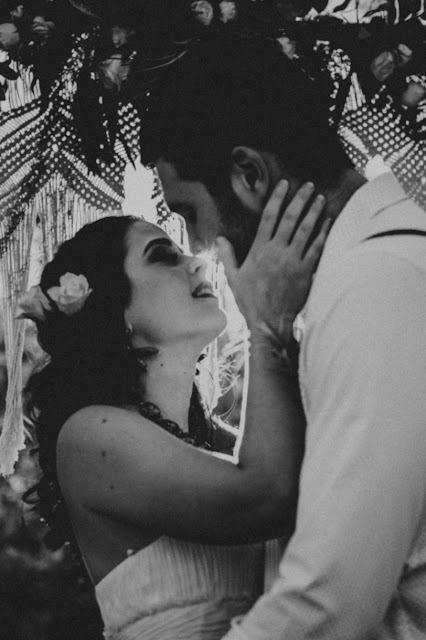 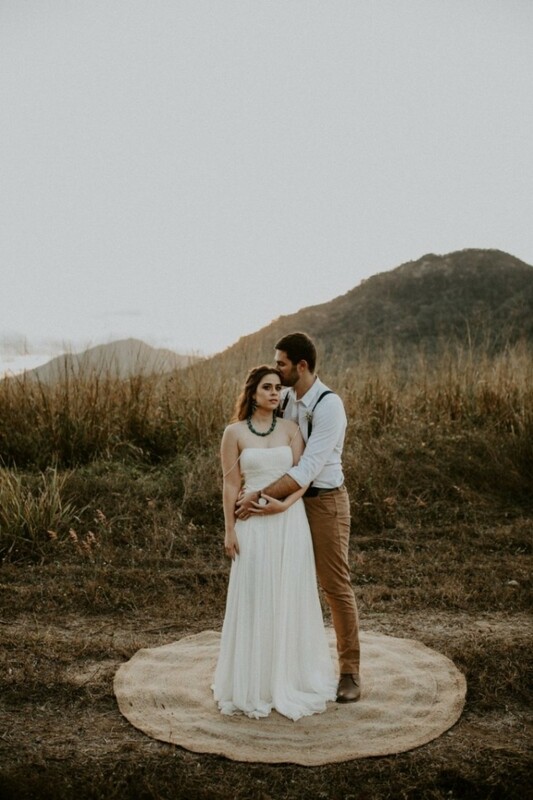 After affectionate embraces and tender moments, hair and make-up artist Chloe Wheeler arrived at that house to perform her magic and transform this already stunning lady into our blushing bride for the day. 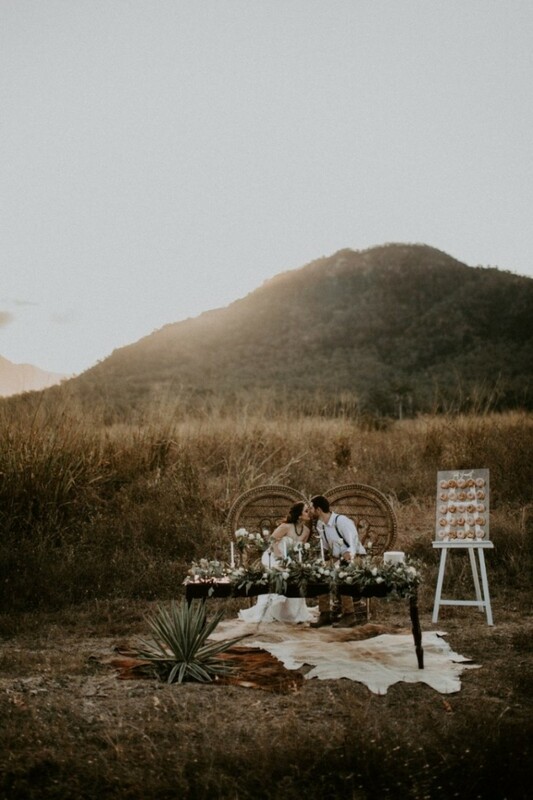 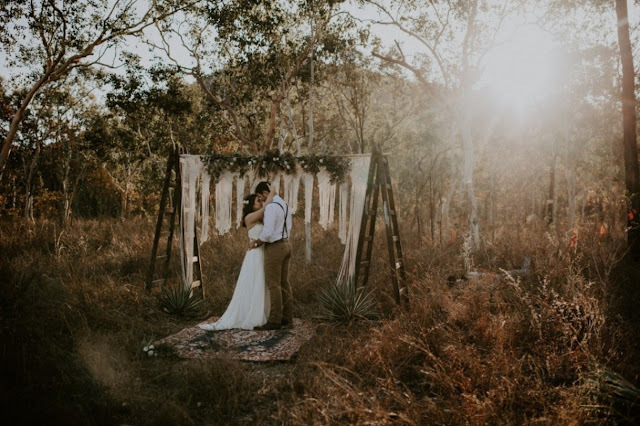 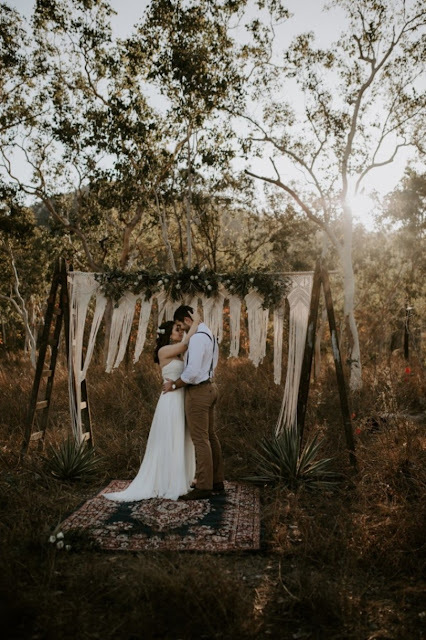 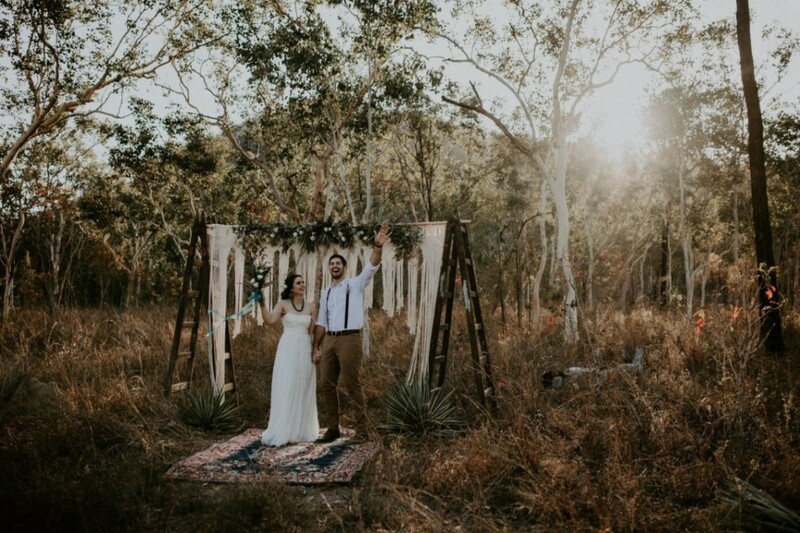 We later progressed to our wedding location, The Farm Plumeria Road, which is surrounded by untouched Australian bushland. 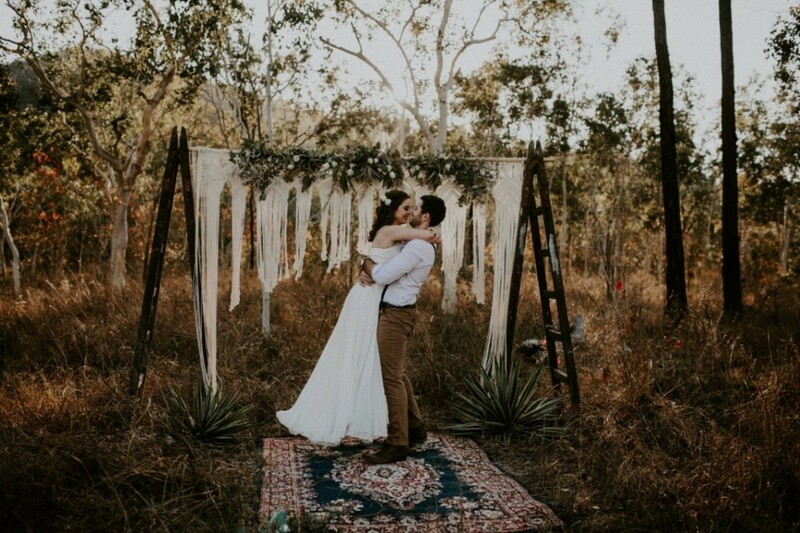 We used rustic painters ladders, an oriental rug, macrame, succulents, and carefully crafted florals, by Max and Lacey Floral Design, to transform the bush into our secluded ceremony location. 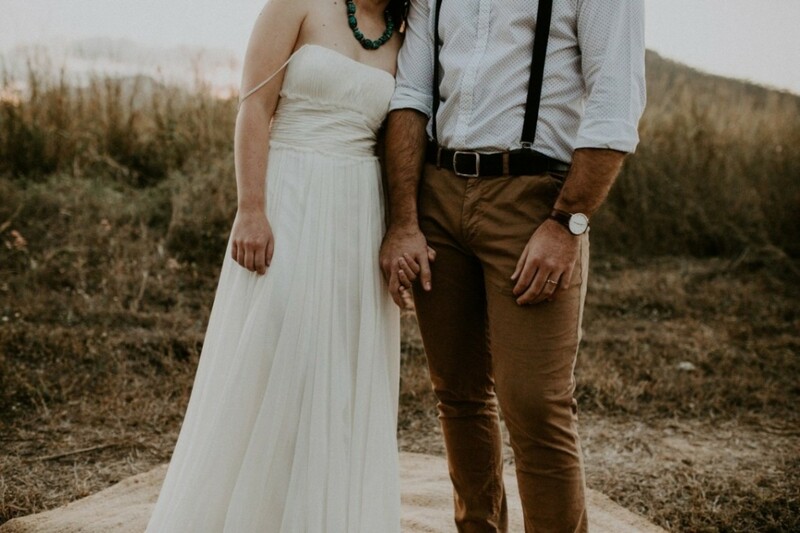 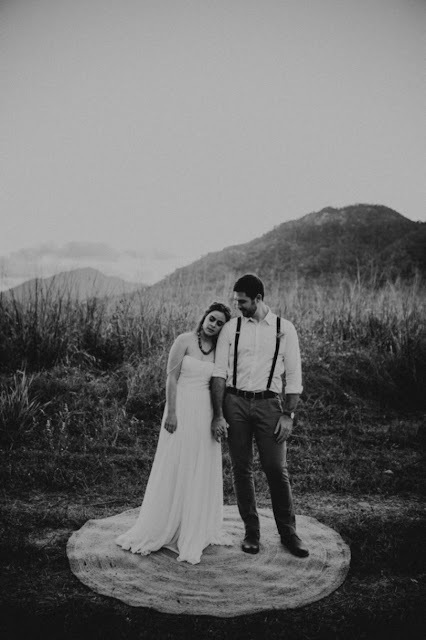 We wanted the wedding to ooze an intimate, relaxed vibe so we kept all attire simple and comfortable. 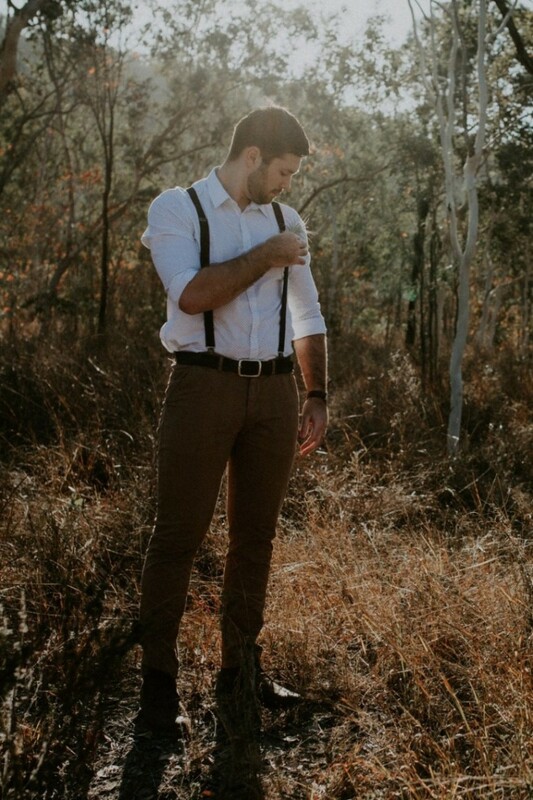 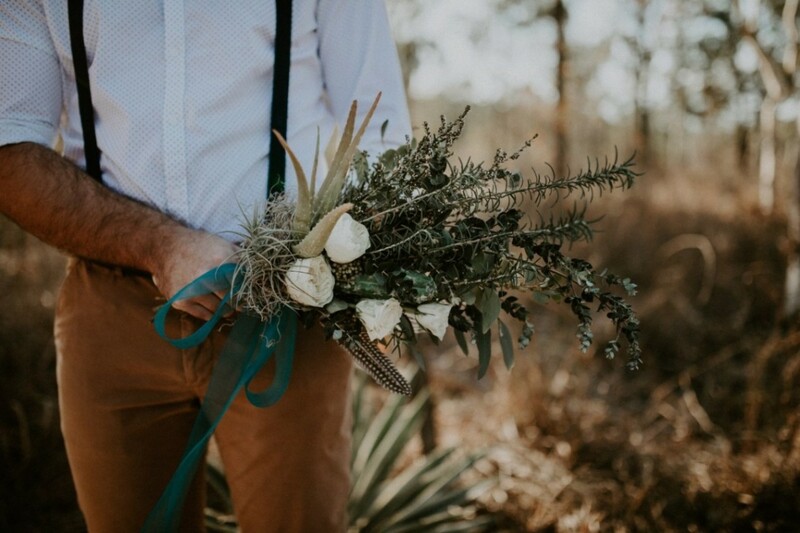 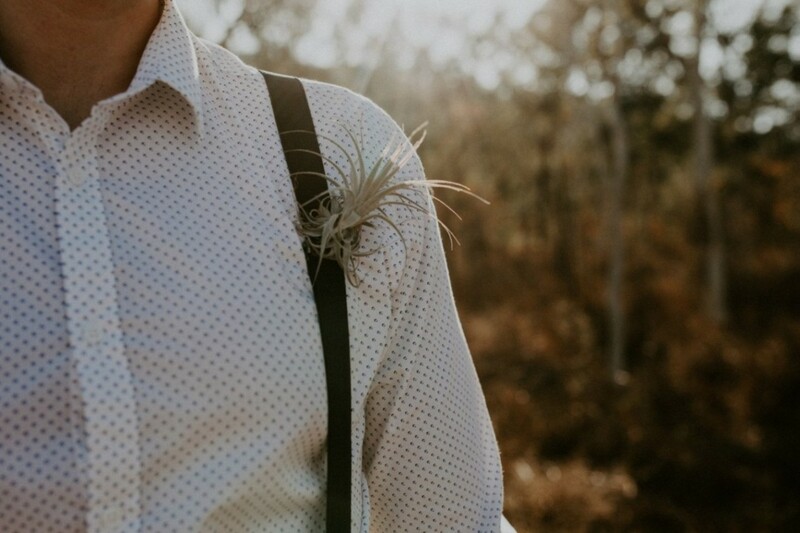 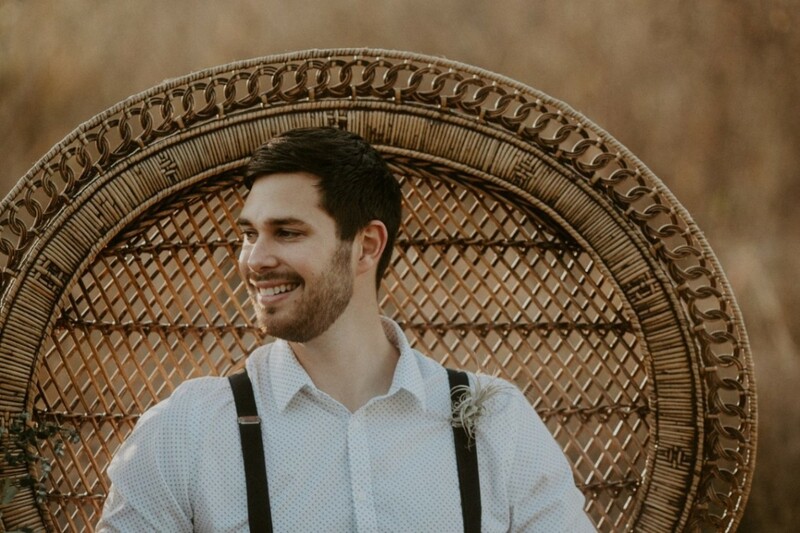 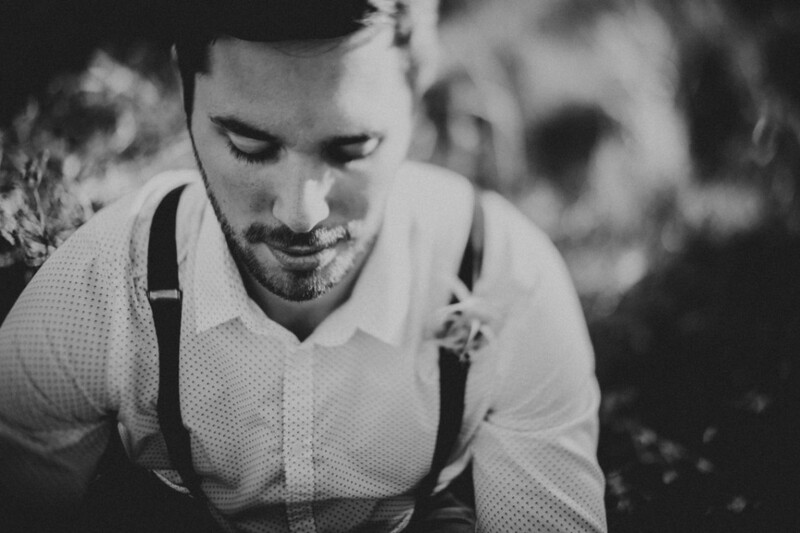 The groom was dressed in chinos, a white, minimally patterned dress shirt and braces, his boutonniere was a quirky air plant to match those used in the arbor and Bride's bouquet. 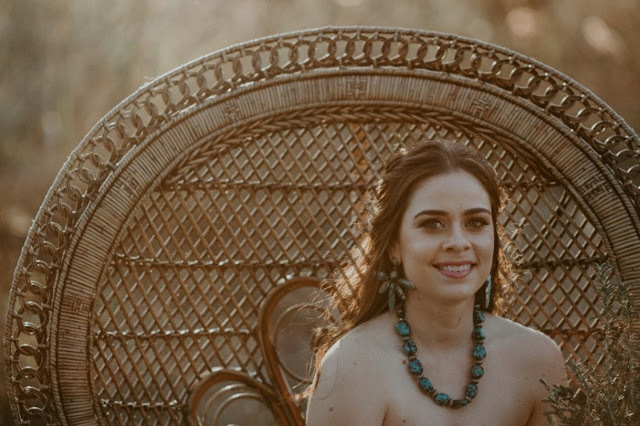 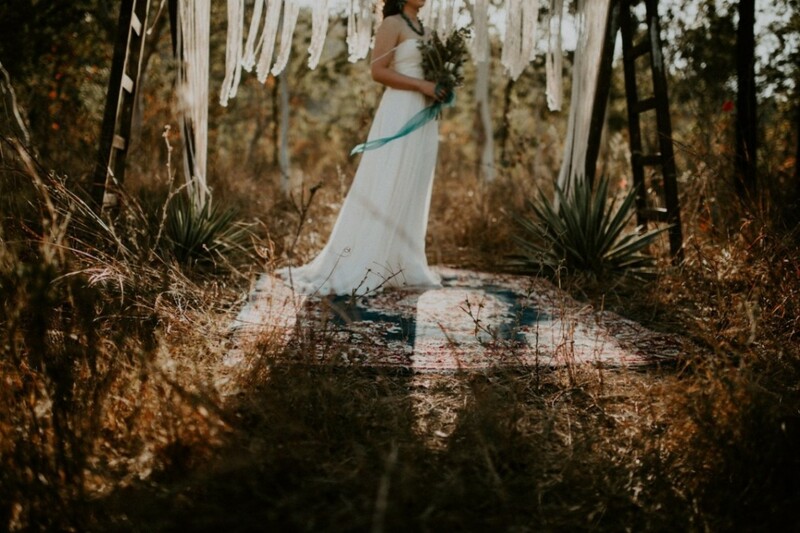 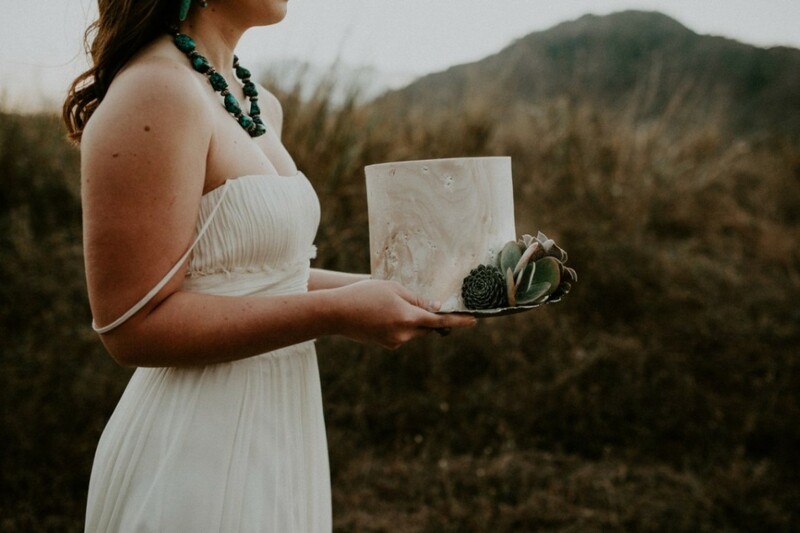 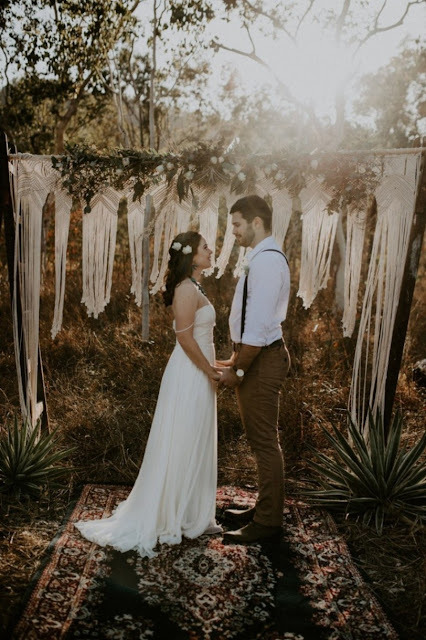 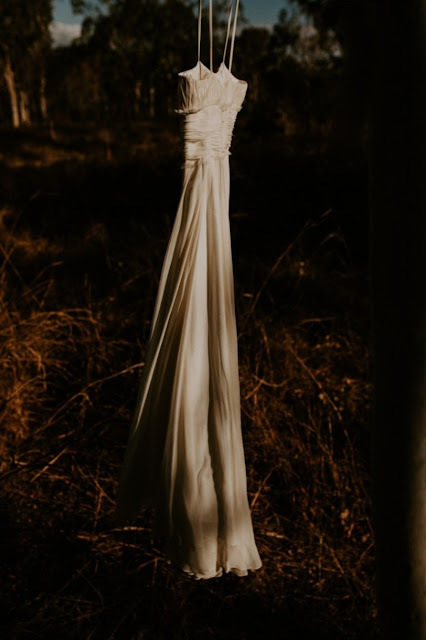 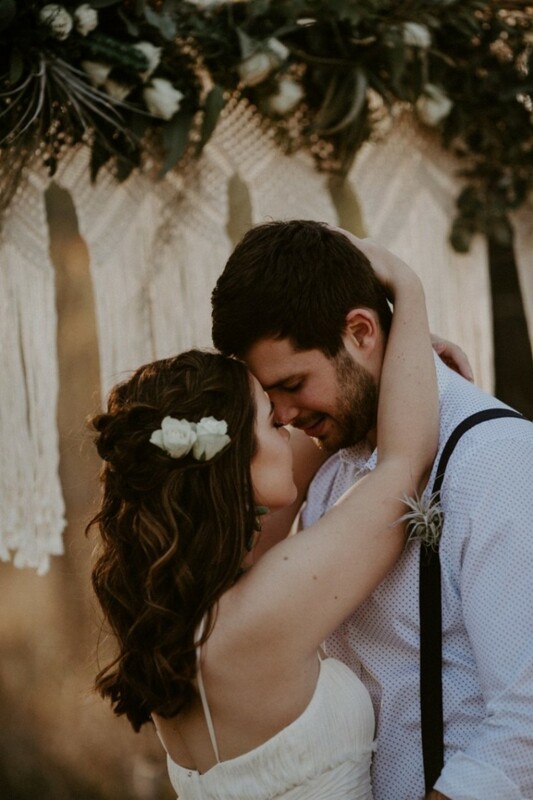 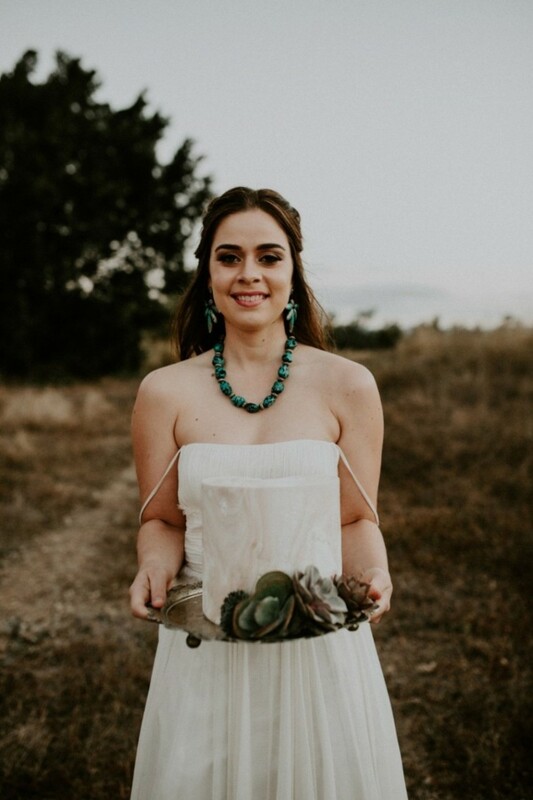 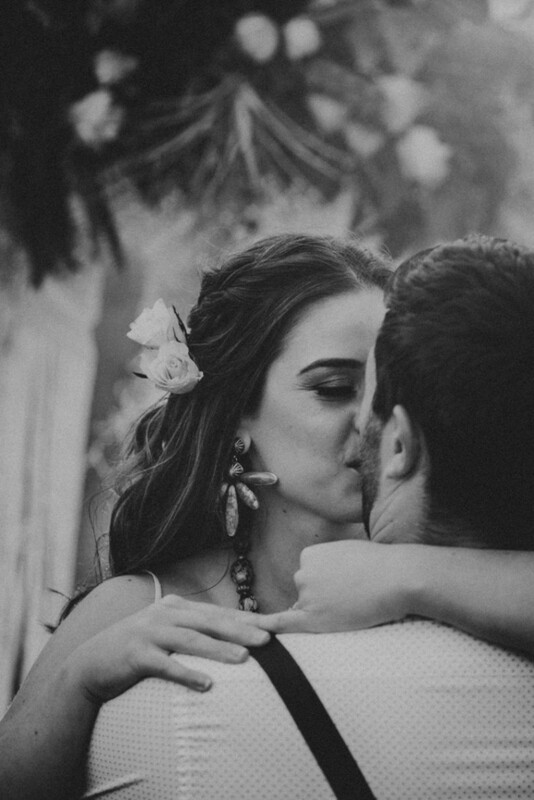 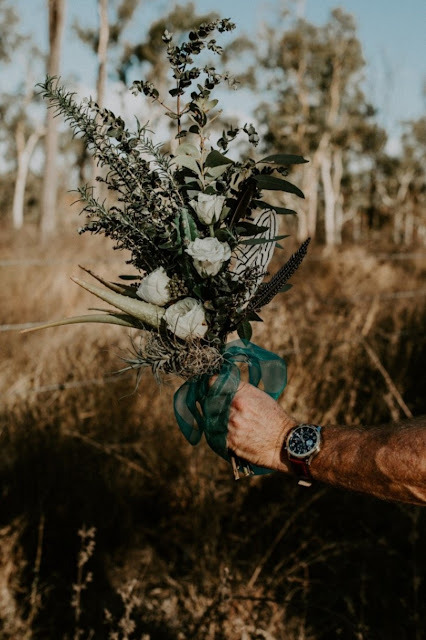 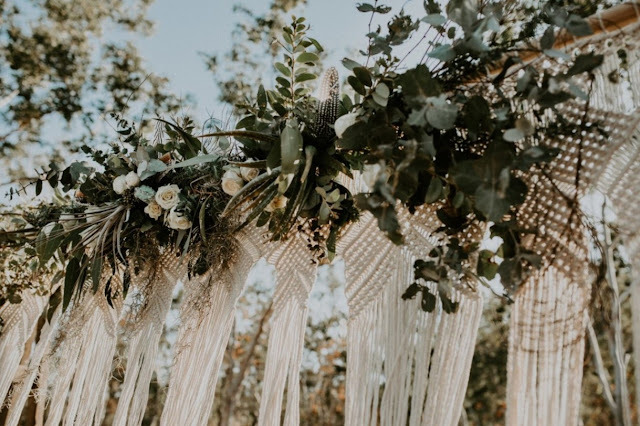 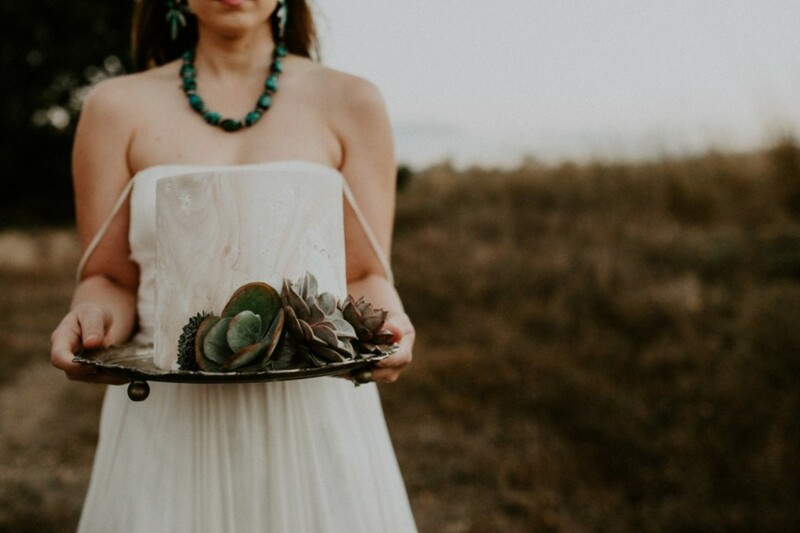 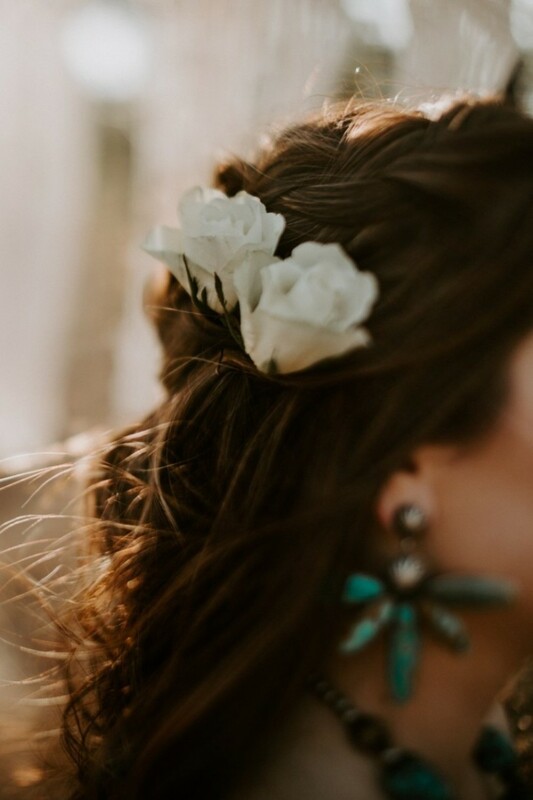 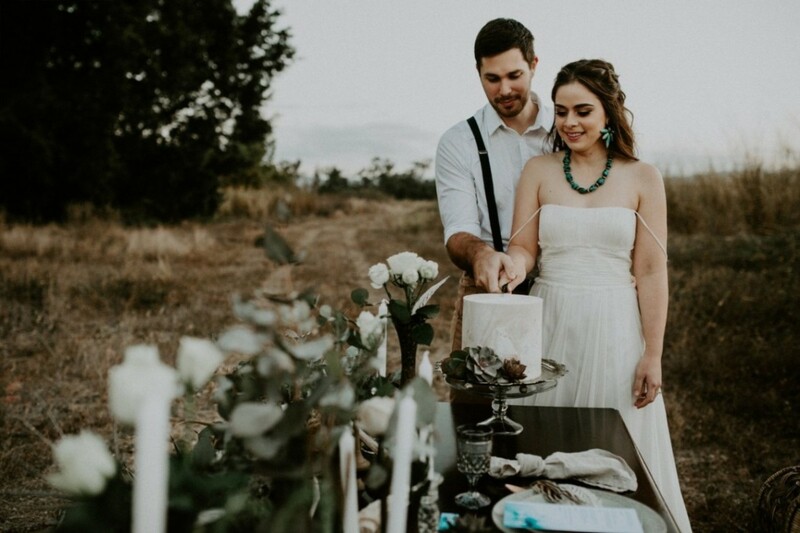 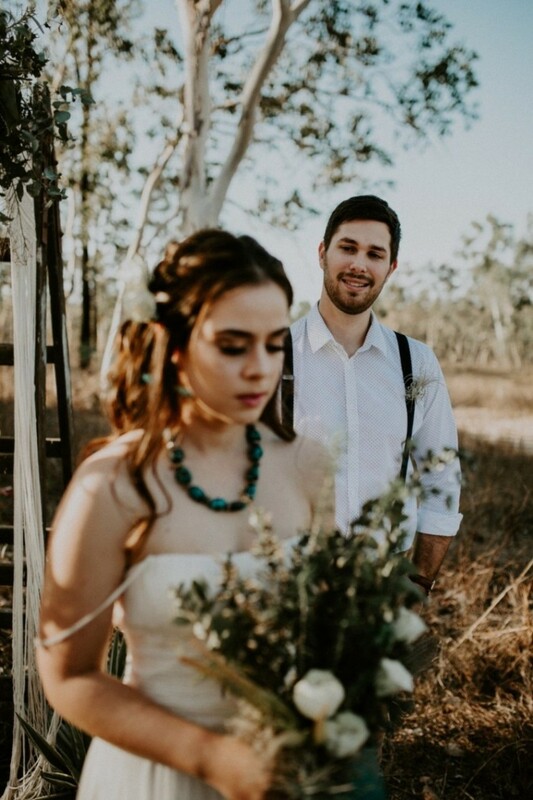 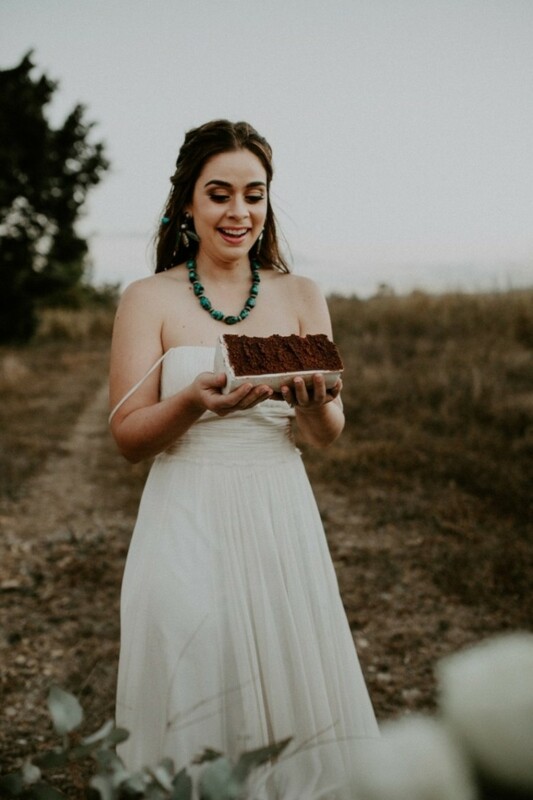 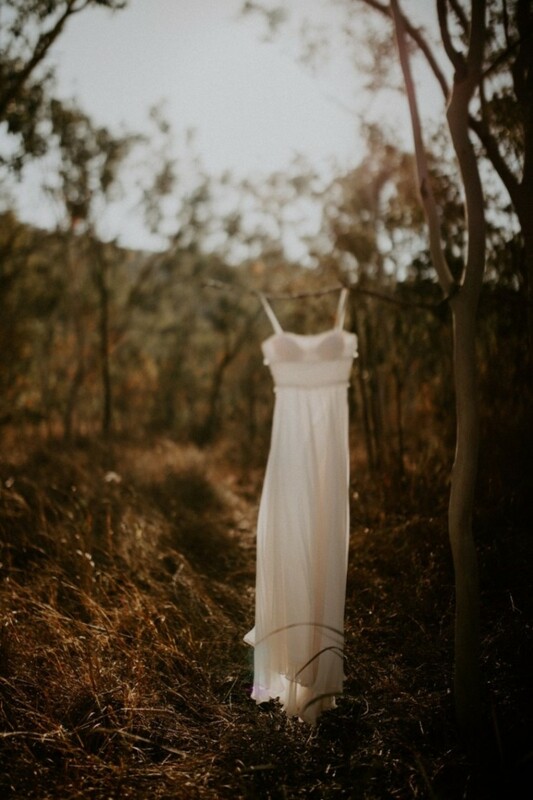 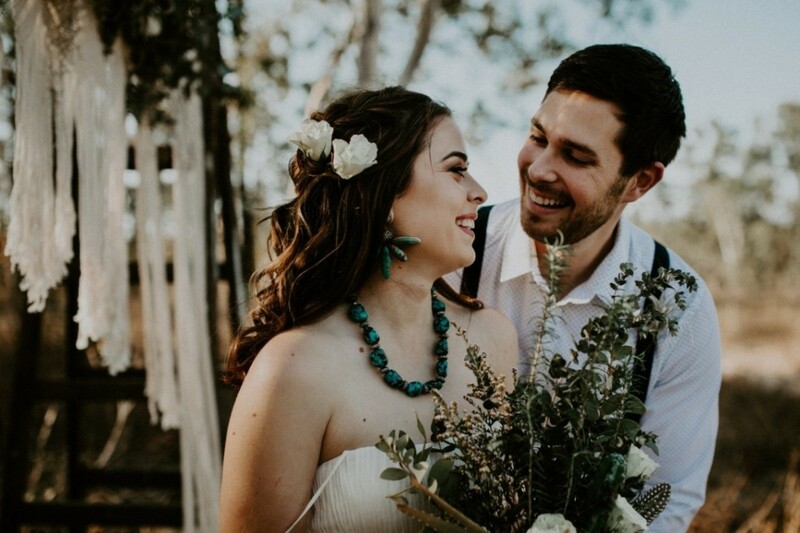 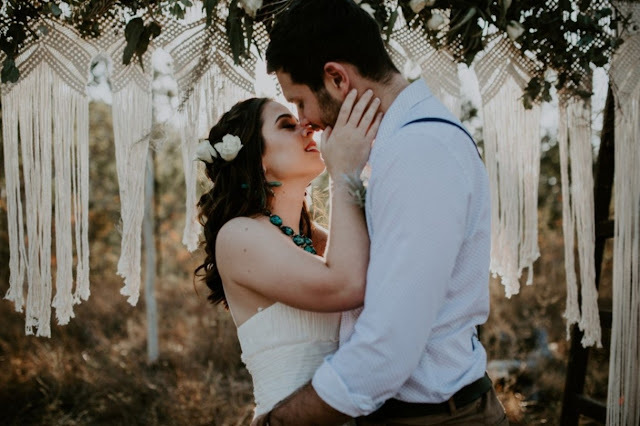 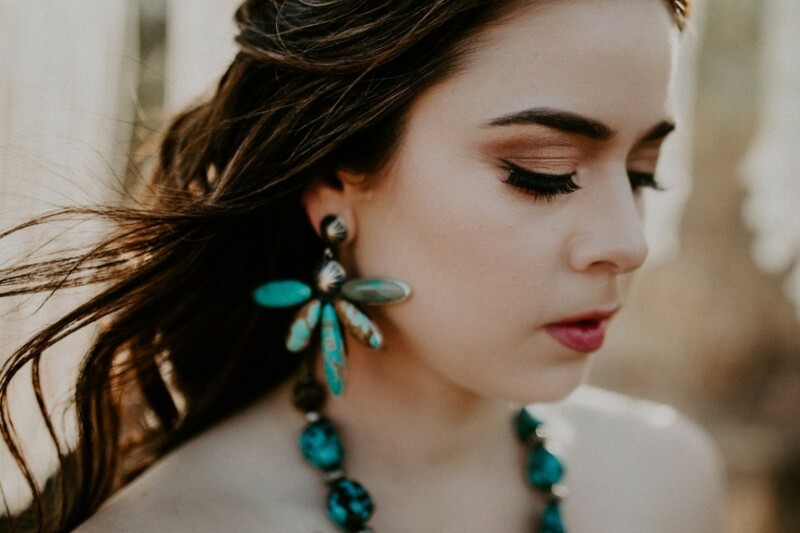 The bride wore a simple, flowing, silk gown, from Signature Bridal and Formal, and carried a bouquet of aloe, rosemary, eucalypt, feathers and cream roses, she was adorned with chunky turquoise jewellery. 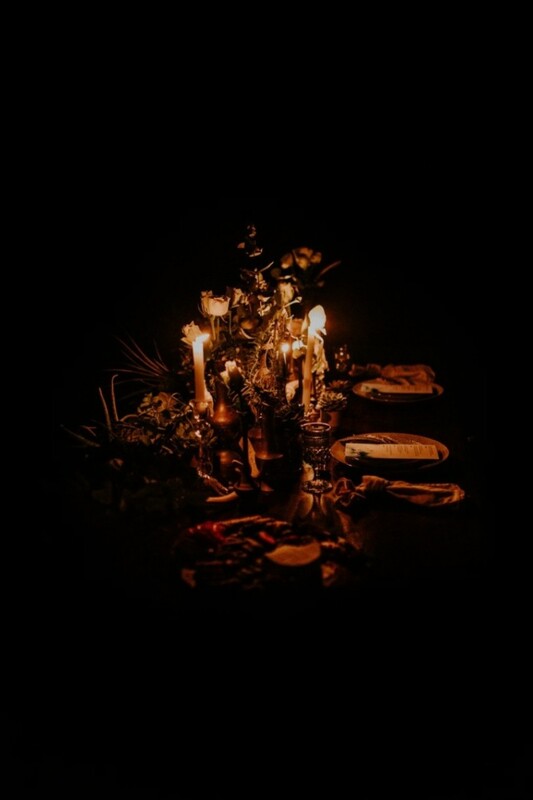 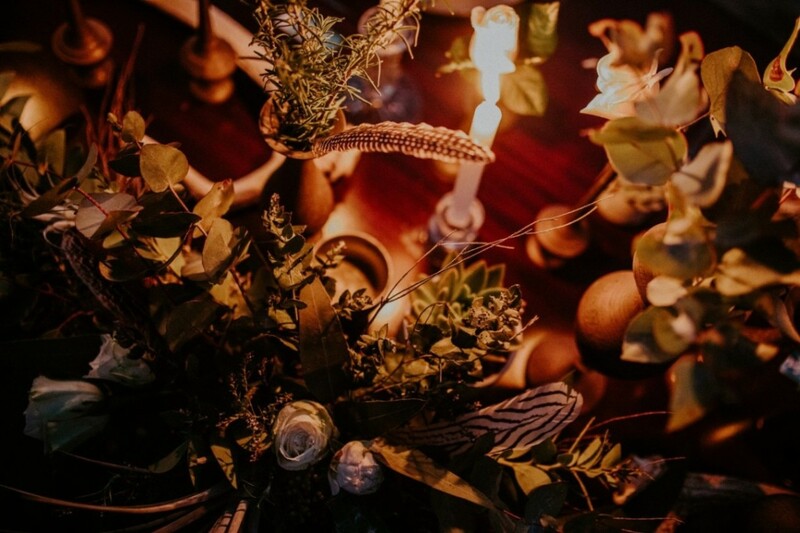 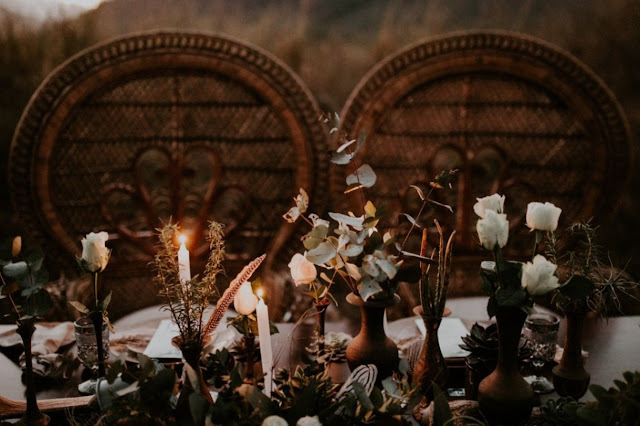 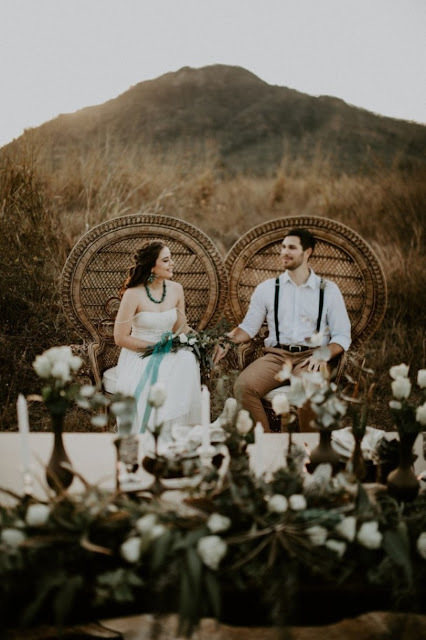 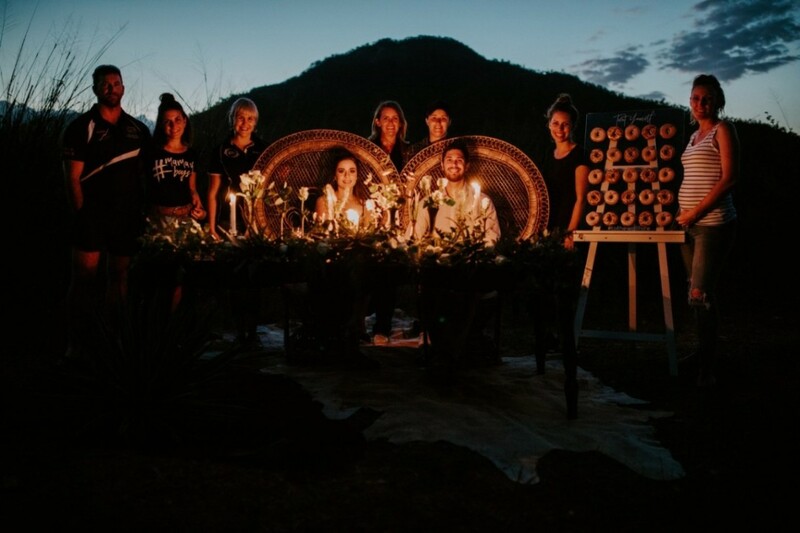 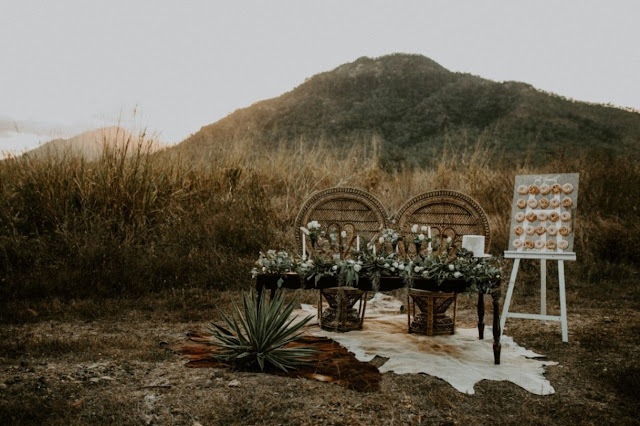 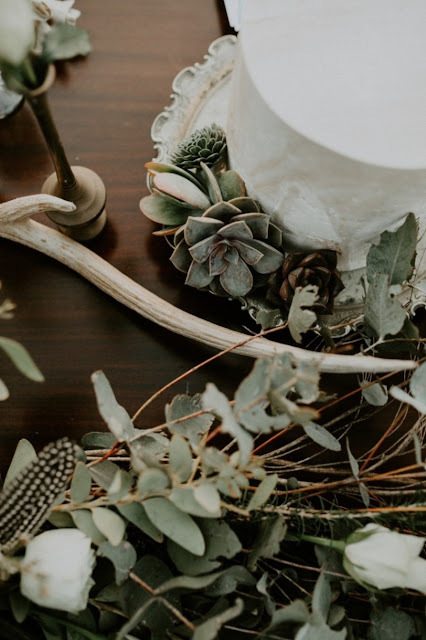 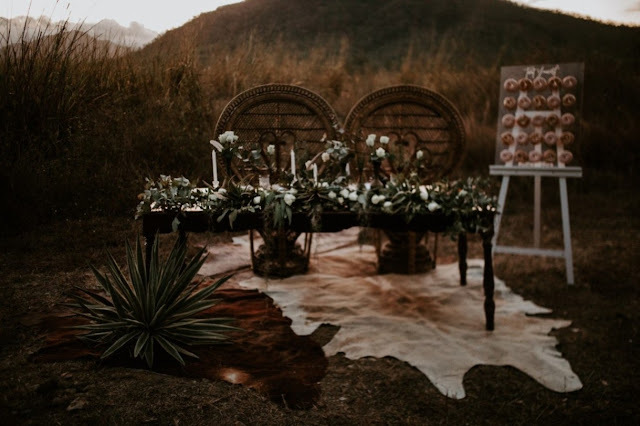 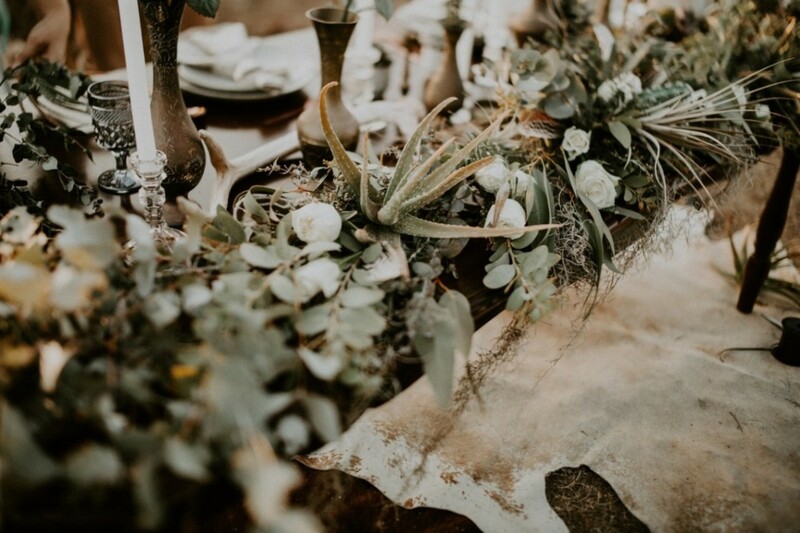 The Vintage Styling Co created a truly magical reception venue using peacock chairs, cow skin rugs, succulents, antlers, and vintage finds. 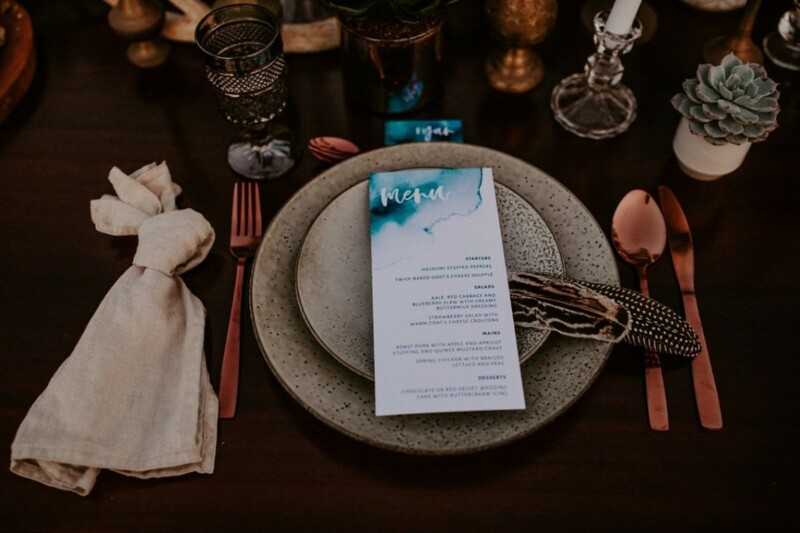 Each place setting consisted of linen napkins, vintage glassware, ecru speckled plates, and metallic flatware. 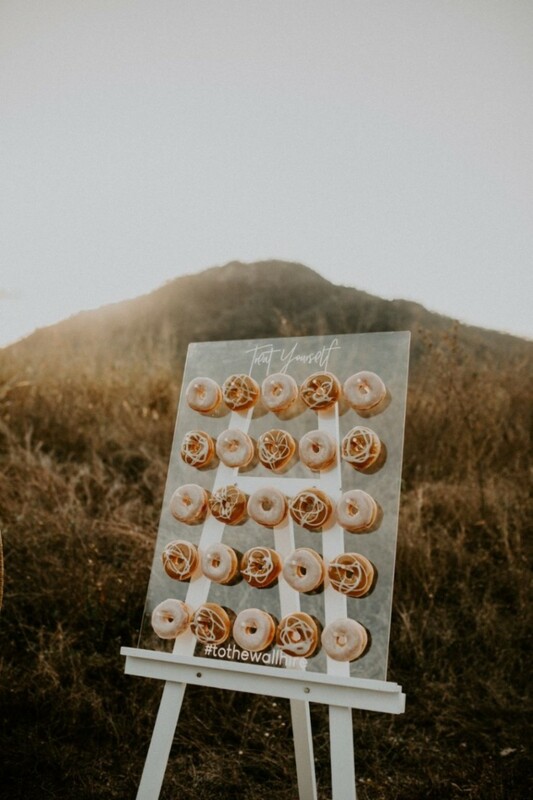 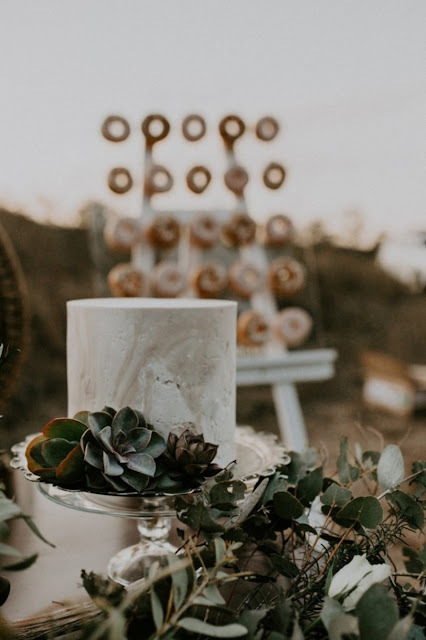 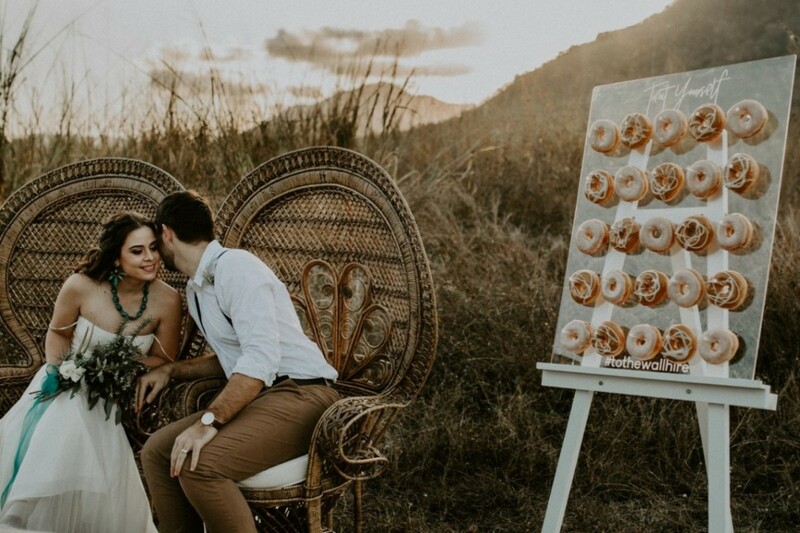 The donut wall supplied by To the Wall Hire was a hit for all involved and looked perfectly at home next to the bridal table, it's clear acrylic backing allowed for the location to peek through and the mix of glazed donuts were perfectly on theme. 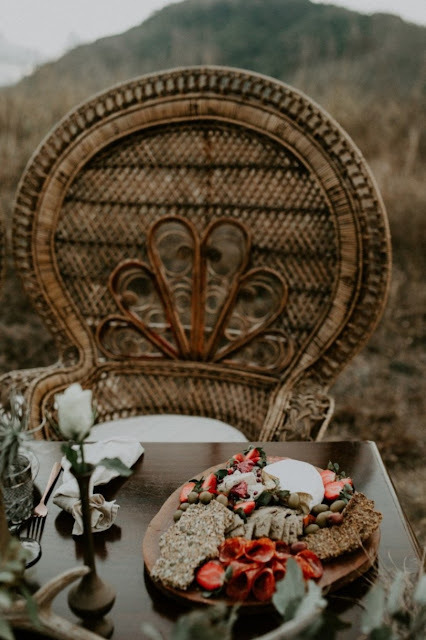 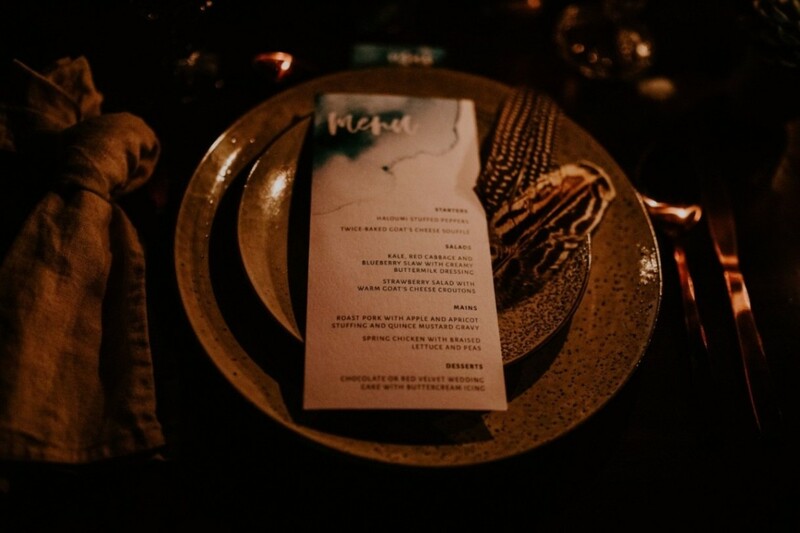 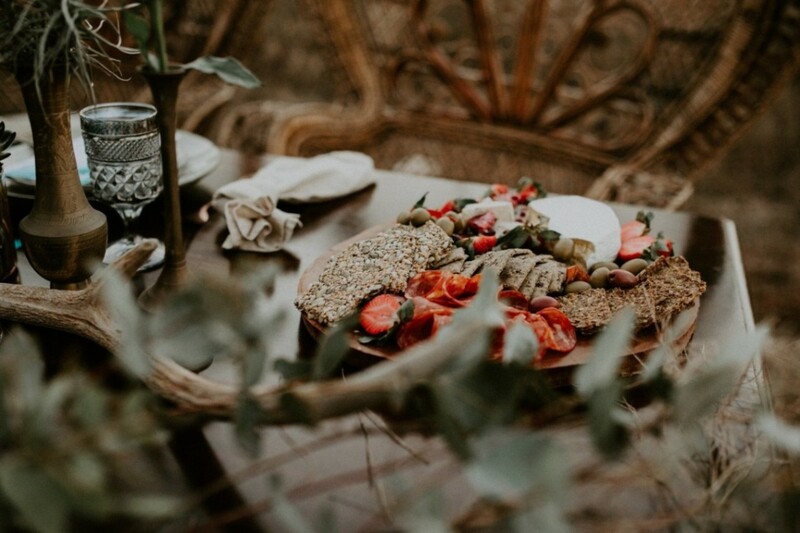 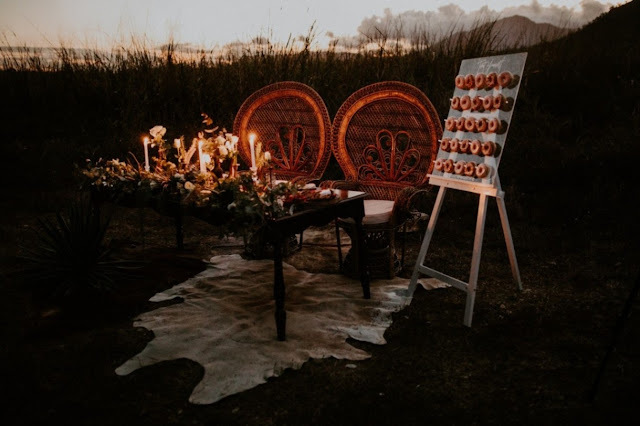 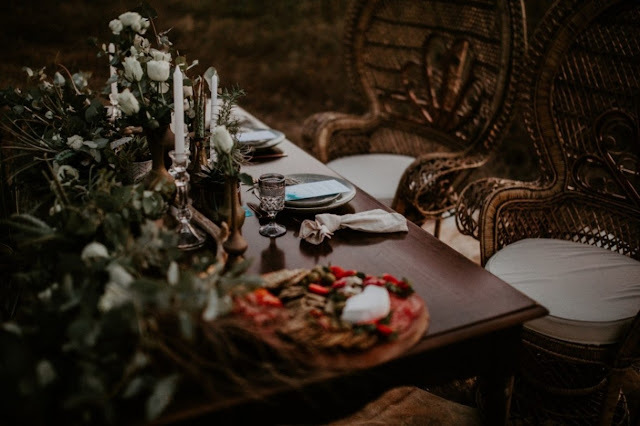 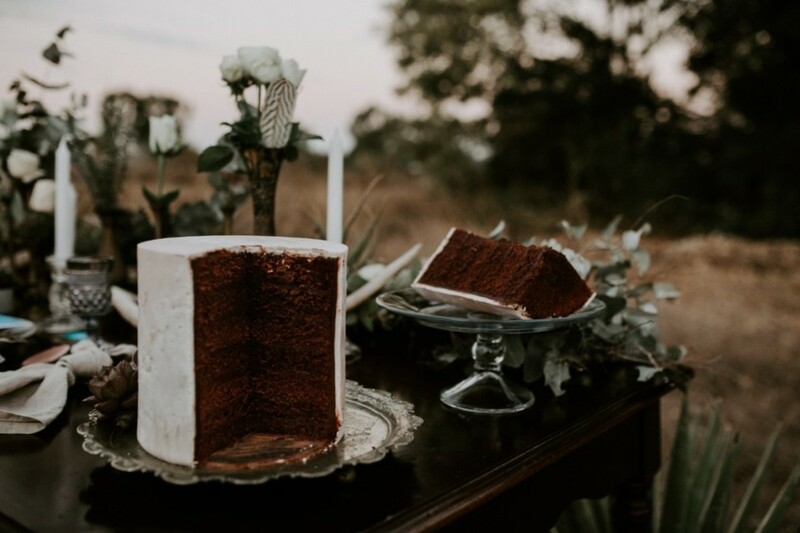 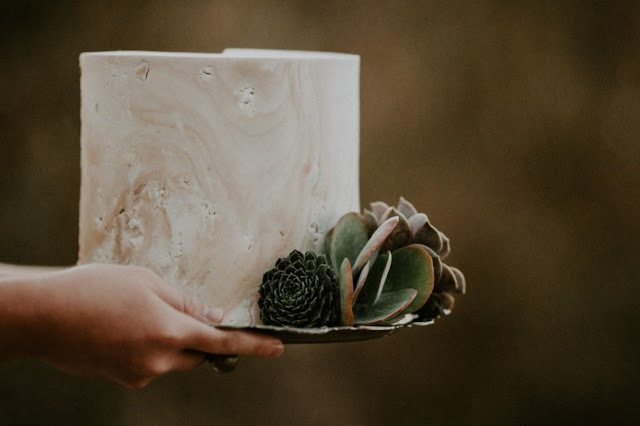 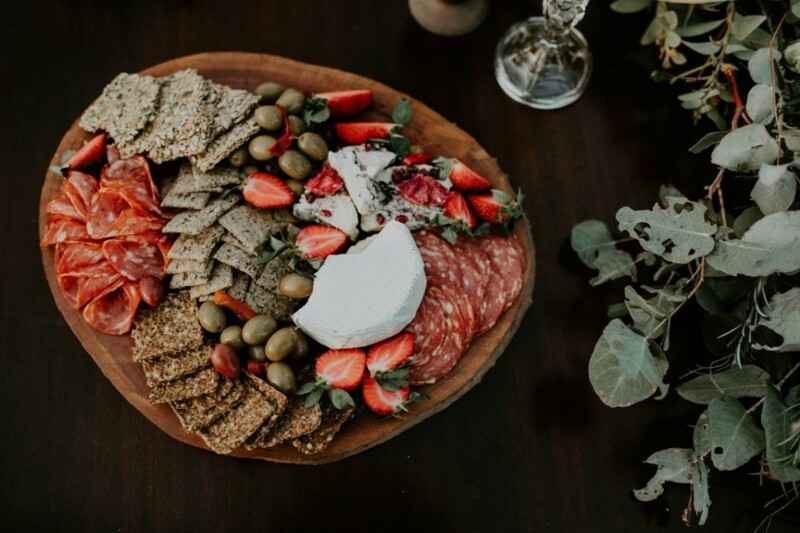 On the table amongst the natives, cream candles, succulents and air plants was a rustic, organic food platter supplied by Family Life Organics and a textured, minimal, chocolate layer cake that was so understated it spoke volumes, Paper and String crafted this scrumptious delight. 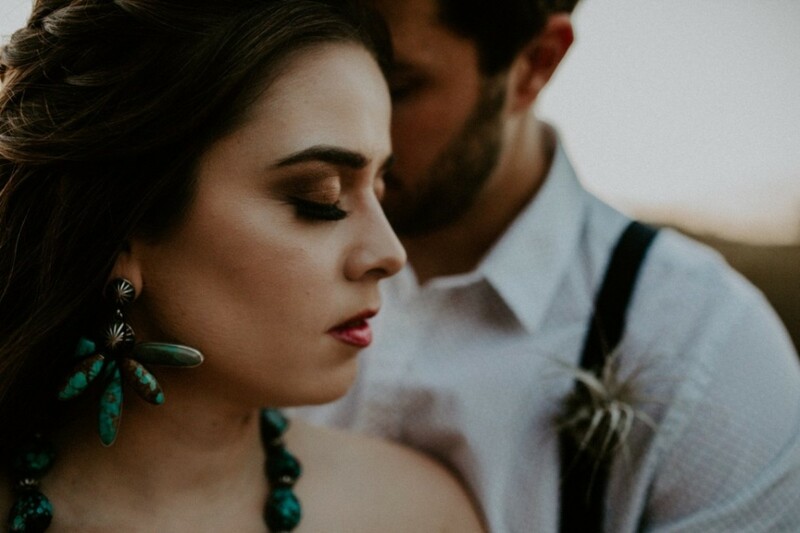 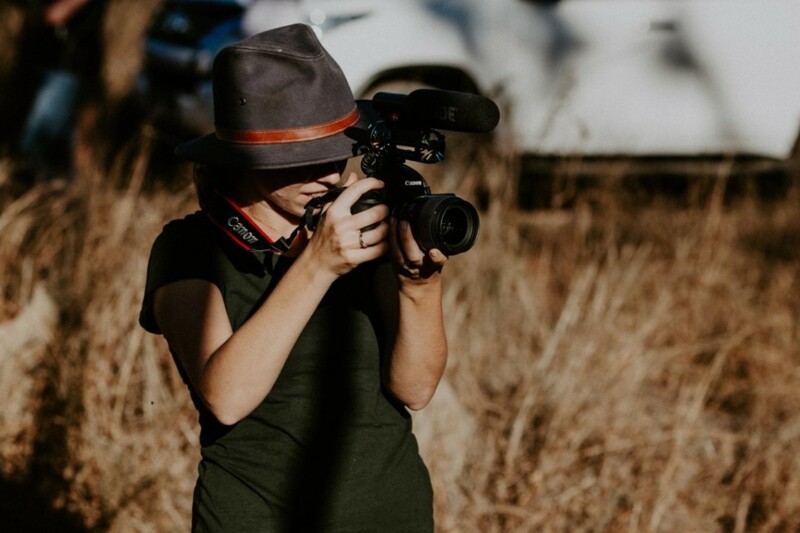 To top off the entire event Lauren + Douglas Photography and Films captured the entire Wedding shoot in motion. 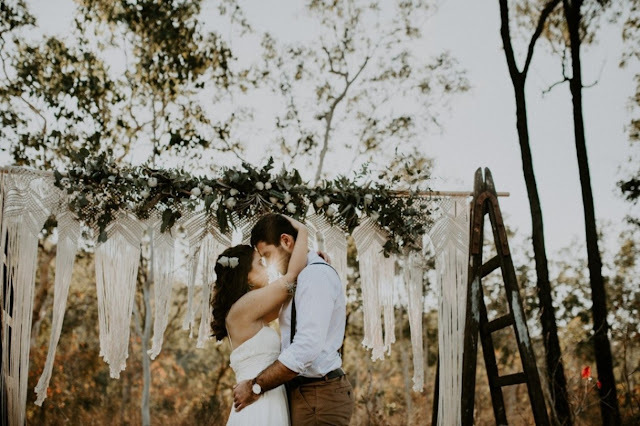 This spectacular film can be seen here, the vows read by the couple in this video are from their actual Wedding and we were privileged to have them share that with us. 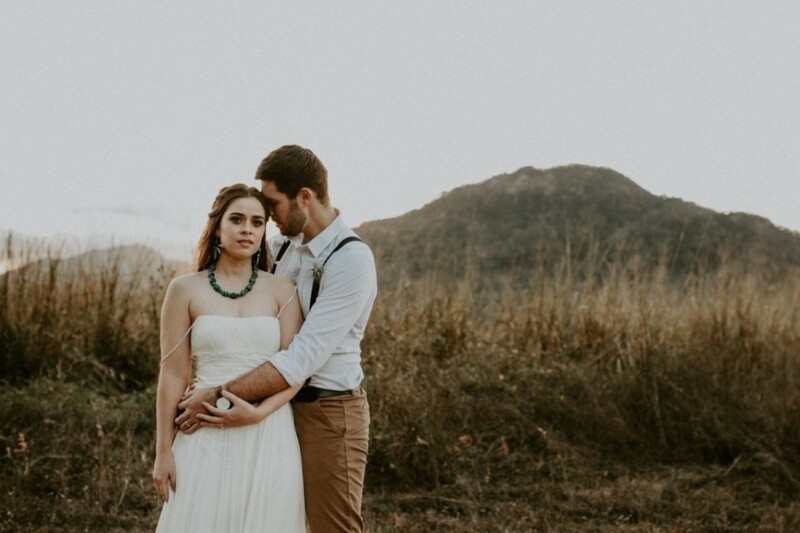 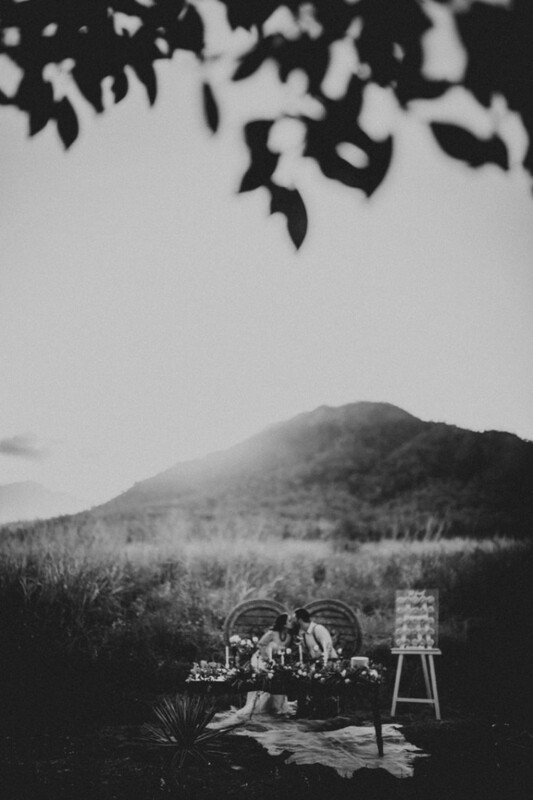 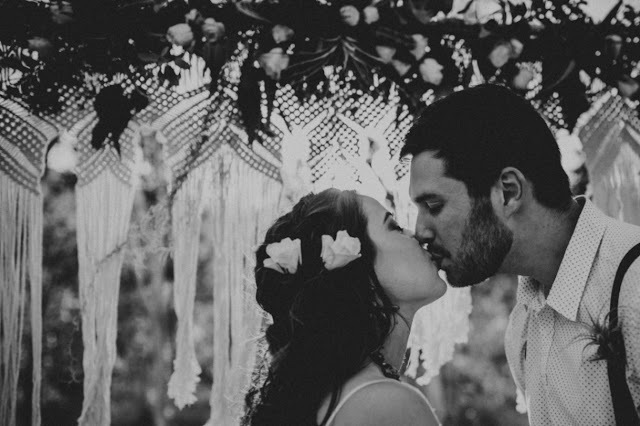 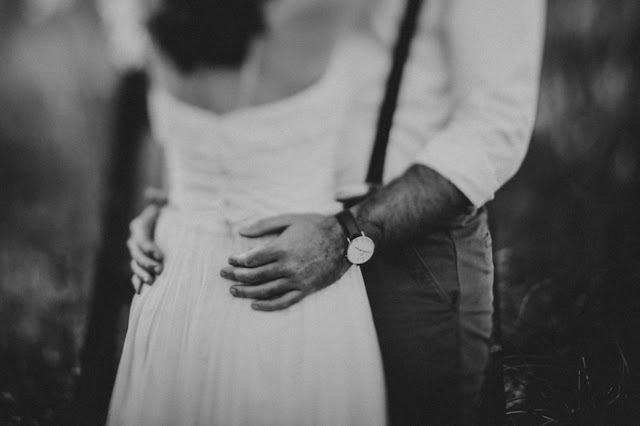 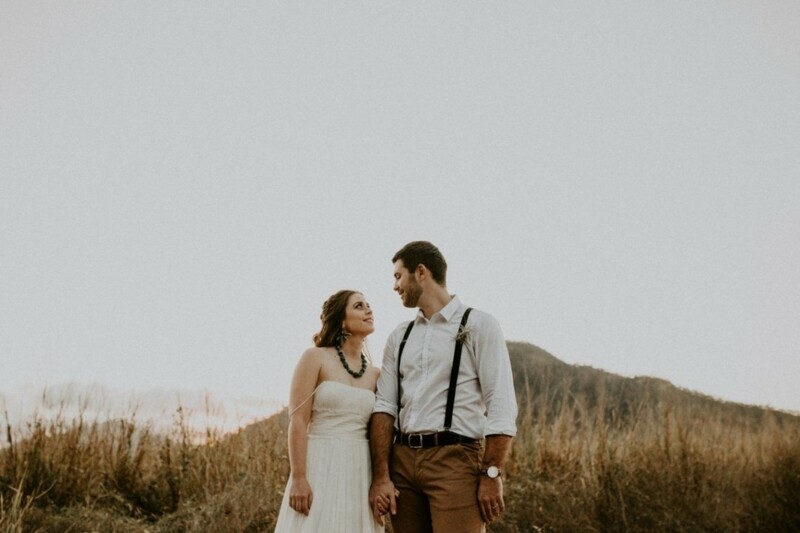 The Farm - Styled Wedding from LAUREN + DOUGLAS on Vimeo.